1. Retail bonanza: It's a big day for global retailers. The US Census Bureau will publish retail sales data for February at 8:30 a.m. ET. Economists expect the report to show a 0.3% increase in sales over the previous month. There will also be some US company data on offer. Clothing retailer Express (EXPR) will publish results before the open, and Williams-Sonoma (WSM) will follow after the closing bell. Signet Jewelers (SIG) will also report before the open. The company, which owns mall-based Kay, Jared and Zales, reported weak sales last quarter and over the holidays. Mall closures are hurting the affordable jewelery brands. In Europe, shares in Adidas (ADDDF) jumped 9% after the company lifted its profit forecast and said fourth quarter sales had jumped 12%. The German sports retailer also announced a €3 billion ($3.7 billion) stock buyback program. Inditex, which owns the Zara fashion brand, reported a 7% growth in profits in 2017. The Spanish retailer also said its online sales grew 41% in 2017. Shares were trading 3% lower in Madrid. 2. 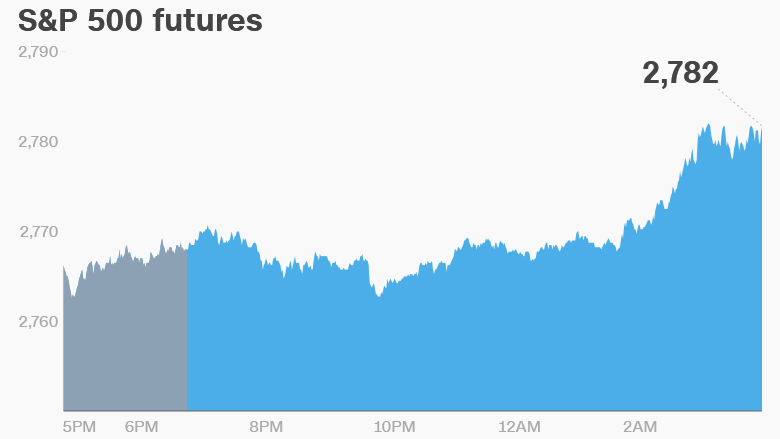 US politics: US stock futures were pointing higher after a day of political turmoil. The Dow Jones industrial average dropped 0.7% on Tuesday after President Donald Trump ousted Secretary of State Rex Tillerson. The S&P 500 shed 0.6%, and the Nasdaq closed 1% lower. "US equity markets closed sharply lower after the dismissal of US Secretary of State Tillerson, despite the Nasdaq clocking a fresh intraday record high earlier in the session," analysts at Accendo Markets wrote in a note to clients. Meanwhile, the results were too close to call in an election to fill a congressional seat in Pennsylvania. The race has been viewed as a preview of mid-term elections to be held in November. Trump handily won the Pennsylvania district in 2016, and the close results suggest major losses for Republicans later this year. 3. UK to act on Russia: UK Prime Minister Theresa May is expected to outline how the UK will retaliate after a nerve agent was used to attack a former double agent and his daughter in Britain. Investors will be watching closely. The measures could include financial sanctions and asset freezes. 4. Global market overview: European markets opened mixed, following a negative session in Asia. US crude futures ticked up 0.4% to trade around $61 per barrel. 5. Earnings and economics: Del Taco (TACO) will publish results after the US close. Shares in Prudential (PUK) jumped 5% after the insurance firm announced it will split itself into two separate companies. It will spin off the M&G Prudential UK and Europe business from Prudential plc, which will operate in the US, Asia and Africa. The US crude inventories report will be published at 10:30 a.m. ET.